Submitted by lynn on Saturday, October 11, 2014 - 5:48pm. McDonalds is everywhere. But most don't have THIS. 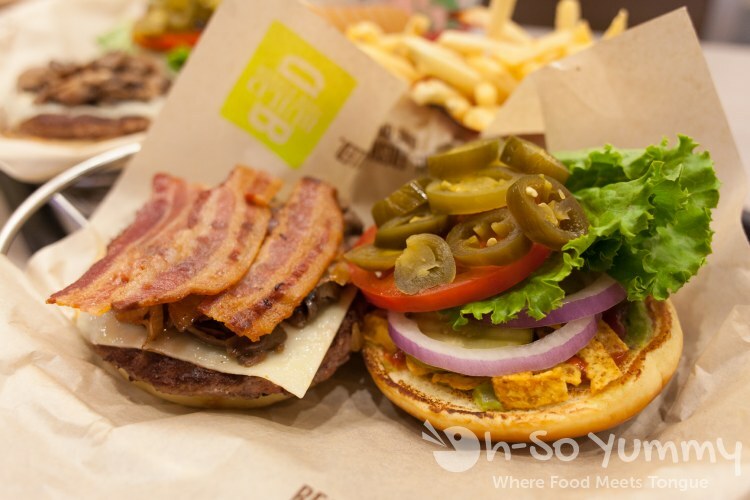 We were invited to try out their new Build Your Burger concept. 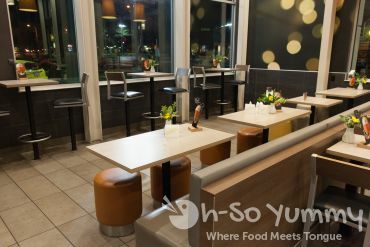 Only four McD stores in the US currently offer this, two in San Diego and two in Orange County! 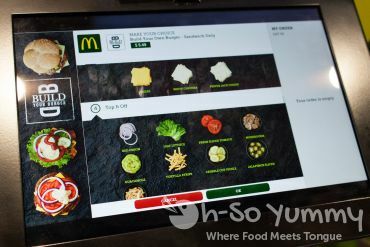 The concept isn't new but the kiosk implementation is where it's breaking some ground in the fast food industry. 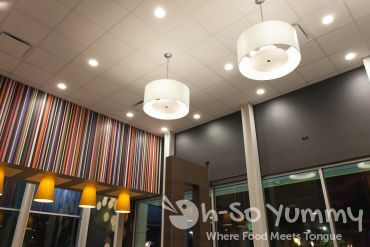 So THIS is the inside of the McDonalds on 3805 Midway Drive in San Diego. Huh? Are we in the right place? Yep, it was remodeled a couple of years ago. Wow, actually kinda impressed. There's no more playpen though! Hello Ben the Guide! Check out these new aprons too! 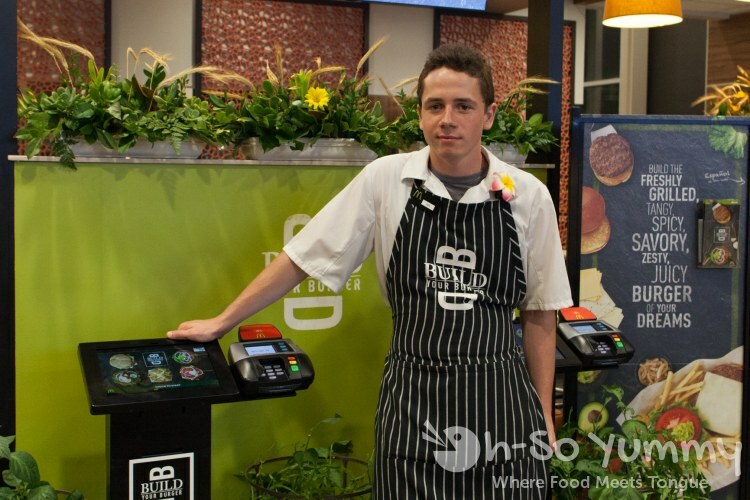 He was here to walk us through the Build Your Burger process, which is actually quite simple. The base price is $5.49 and the only extra cost is $0.80 for bacon or $1.25 for an additional patty. Otherwise the rest are FREE with your burger if you choose. 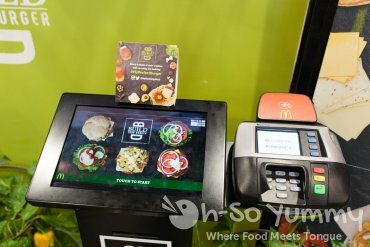 After ordering (including regular menu items), payment can be made on the credit card machine or at the counter where you need to bring up your ticket. Patrons sit down and hang up your ticket like this. 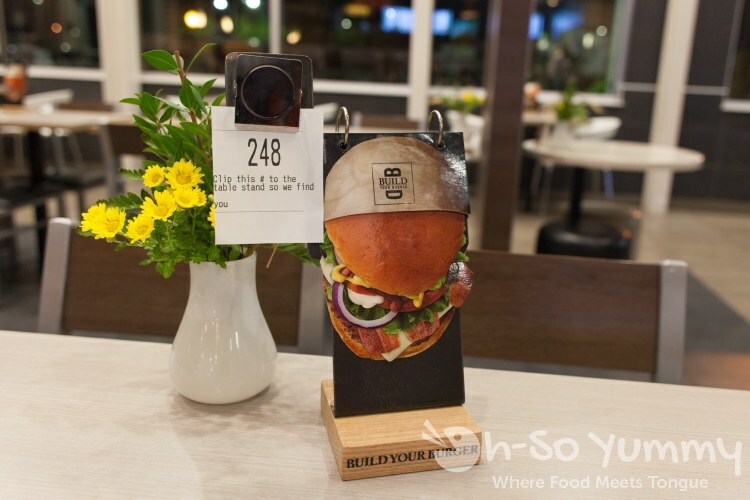 This custom burger means they actually bring it to YOU! We ordered the burger combo meals complete with fries and a drink. 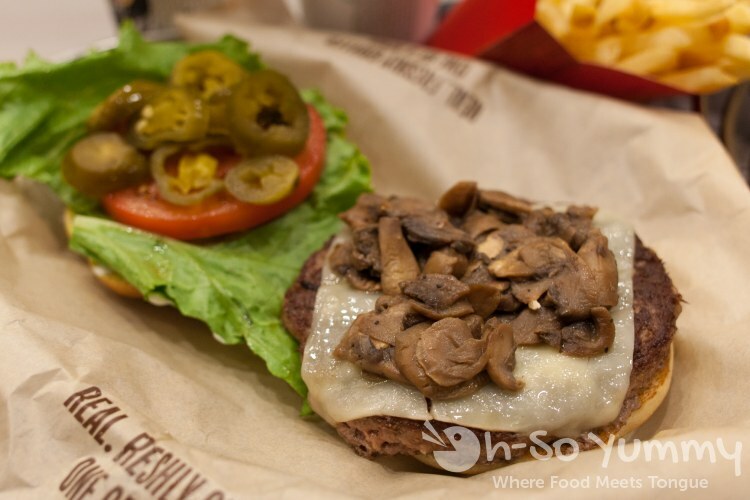 I went with the pre-configured So-Cal Burger and added mushrooms to it. Dennis built his own and pretty much put EVERYTHING on it. 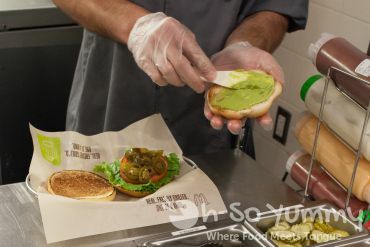 Bacon, guacamole, tortilla strips, jalepeno, red onion, tomato, lettuce, white cheddar, pickles, with the sweeter Artisan Bun. He decided to call it MacDaddy Style haha! Put the two halves together and there's your customized quarter pound burger. 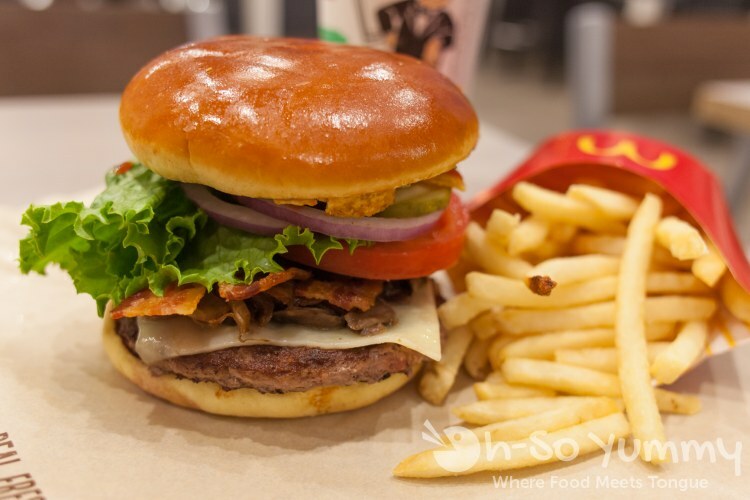 These are cooked to order and hand-seared, which takes extra time compared to the traditional method that simultaneously cooks the patty from the top and the bottom. 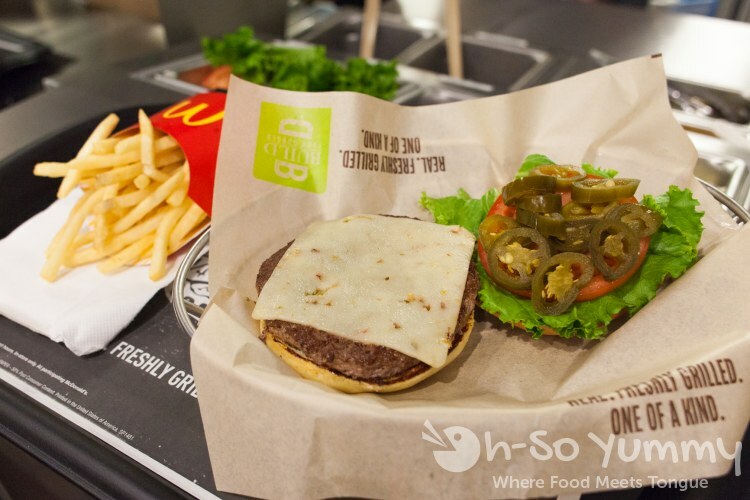 Of course, the meat patty still starts out frozen (hey it's still fast food). At least there's more toppings to choose from now! We thought these were quite juicy without feeling too greasy. Guacamole is a must have for Dennis and he was surprised they didn't add it sooner. I actually like the sweeter Artisan bread which reminds me of King's Hawaiian! Here's a little behind the scenes: the building station. Sauces on the side and ingredients per your order. Tada! It's ready to eat and comes in nifty silver servingware. You can also order to go and it comes in two separate halves in a wider box. YOU could try this out for yourself! We're giving out two $10 giftcards to McDonalds. Winner will be randomly selected and contacted through email so make sure it's valid! Winner must respond within 48 hours or we'll draw another winner. Giveaway open to US residents 18+ and ends Wednesday October 22, 2014 at 11:59 PST. Good luck! Disclaimer: We were provided giftcards for a giveaway. All opinions remain our own. yum. 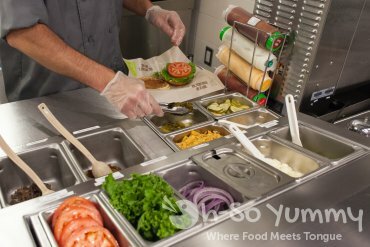 i'd put: white cheddar, red onion, guac, lettuce and a tomato. really want to try it!! I would get mushrooms and cheese! I want to try it with the tortilla chips! But they should also offer chicken, not just beef patties. I would customize it with bacon, lettuce, and tomato. I would have bacon and extra pickles. I would customize it with bacon, guacamole, tomato, lettuce, and white cheddar. I would add mushrooms, guacamole and Pepper Jack Cheese. I'd have sharp white cheddar and sweet BBQ sauce! 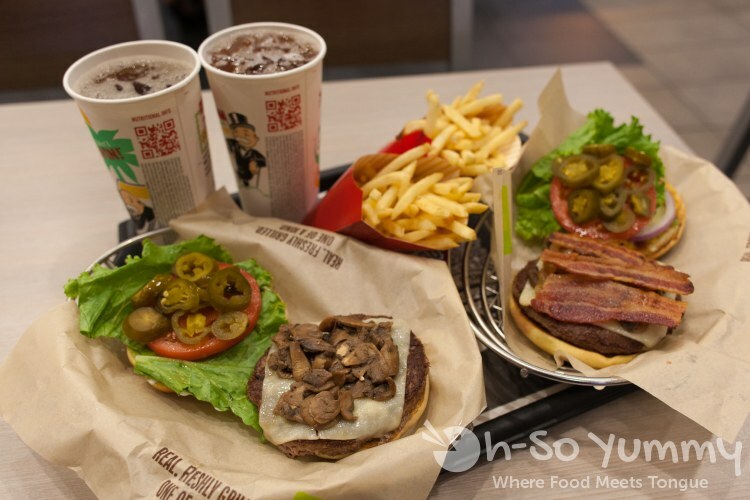 Artisan bun and American cheese, plus mushrooms! grilled mushrooms and artisan bun! I would get bacon, cheese, and tomato. I would add ketchup, mustard, pickles, mayo, lettuce, and bacon.